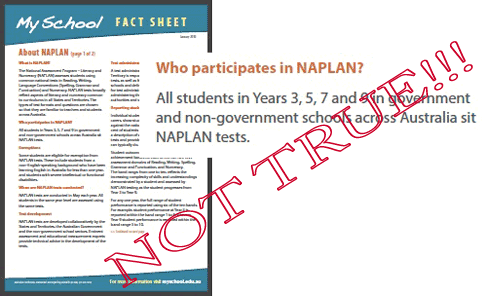 A reminder that any parent or guardian may WITHDRAW their CHILD from having to participate in the NAPLAN 2010 tests (at the bottom of this post, I also add some notes regarding other NAPs occurring this year). 2010 NAPLAN tests are due to be conducted between the 11th-14th of May this year (unless a school makes a request to vary the date). I’m not sure why the MySchool website continues to misinform the Australian public. They have already been informed of this, and appear to simply avoid fixing their error (as of March). Not only is it the case that quite a number of students do NOT participate, the document totally omits any reference to withdrawing a child. Instead, it makes sole mention of exemptions, thereby falsely implying that the only option for non-participation is for students with specific needs. This is, as will be obvious from what follows, simply not the case: ANY student may be WITHDRAWN from participating in NAPLAN by their parent or carer. 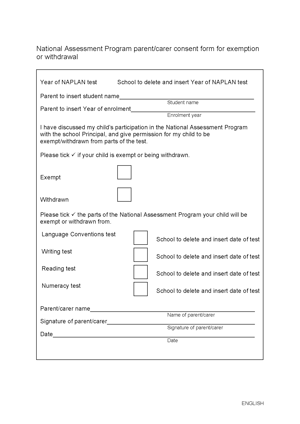 Read on for details on how to withdraw from participating in NAPLAN. In 2009 in some schools, every student in 3, 5, 7 and 9 was withdrawn by their respective parent! Withdrawal is different to exemption: for an exemption, rather strict conditions apply. For withdrawals, the process is simple (in most States and Territories at least – as long as the parent or carer is aware of the option which, unfortunately, is a little like the plans for an intergalactic bypass as described in The Hitchhiker’s Guide to the Galaxy). 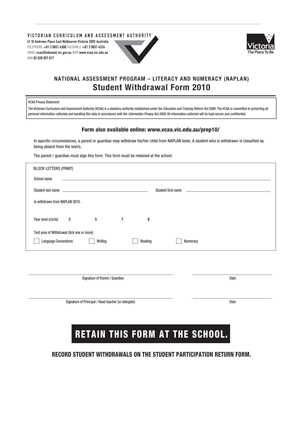 In the event that a parent/carer wishes to withdraw their child from the NAPLAN 2010, signed parental consent using the Student Withdrawal Form (page 24) is required. 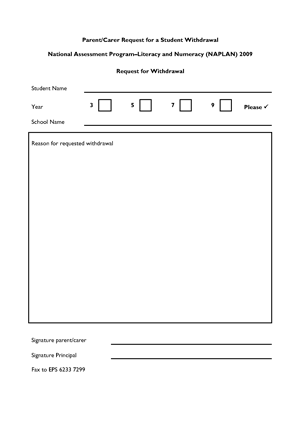 This form is to be retained by the school. …and so, for ease or use, attached below is a copy of that page 24 form (which is also available from the VCAA site). For those interested, apart from my longish entry last year (Cf my blog-post NAPLAN – or the demise of pedagogical principles), the Age has claimed that Victoria has the highest rate of student withdrawals in the nation! Given the many concerns surrounding the as-yet unknown potential uses of data collected and matched to each child in various computer databases (never mind known uses such as recently reported in the Age), it may be of value to carefully consider how our children are being ‘tagged’. It seems that about 10% of Victorian students did NOT participate… some as a result of being exempted, others simply due to their parents or carers signing the withdrawal form. And that despite official documents and information to parents making it rather unknown that withdrawing is really that straightforward! Well done Victoria – though there’s still quite a way to go before it is generally realised that ALL students may be withdrawn by their parents or guardians/carers! Incidentally, of major concern is the Federal Government’s plan as reported in another Age article: “Ms Gillard also promised the government would introduce identification numbers for all school children, to help track the progress of individual students between different schools, school systems and states”. ID numbers?!!!?? 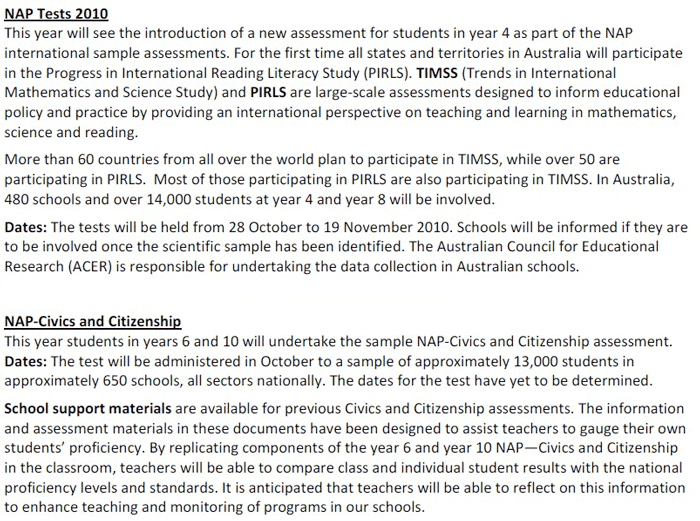 I suppose that this is a ‘natural progression’ from NAPLAN… and has ALREADY begun: Victorian 10 y.o. now have a VSN [Vic. Student Number] that schools have been required to participate in keying the information for! PLEASE note that this year, unlike previous years, you’ll need to tick each box to ensure that your child is withdrawn. It seems that they’re making it increasingly confusing! I have received no information as to the whereabouts of the withdrawal form for schools in the ACT, but have been informally told that the Principal’s Administrative Handbook has the information therein. So it seems that the situation is a little similar to that of Tasmania, which follows. 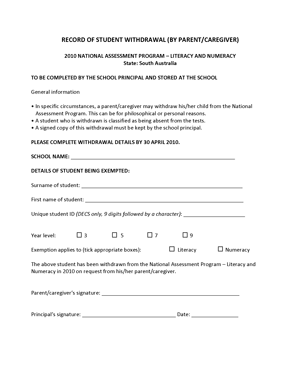 In May, all students in Years 3, 5, 7 and 9 across Australia will participate in national tests that will assess their performance in literacy and numeracy. All students across Australia will be doing the same tests on the same days. This is of course not factually correct, as no student that has been withdrawn, exempted or absent will do so (about 10% in Victoria last year). And, of course, various schools may also have applied for a variation of date as to when to submit the test to students who have not been withdrawn. 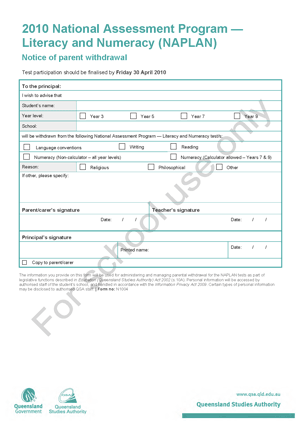 “The form is located on the Department of Education staff intranet for government schools, non-government school principals should have a copy of this form at their school. The process is to discuss the withdrawal with the child’s school principal, completed forms are then sent back to Educational Performance Services and the student is formally withdrawn from the testing. [my emphasis]”. N.B. date for withdrawal in NT: 1st April!!! Parents or caregivers may withdraw their children from the tests. This is a matter for consideration by individual parents in consultation with the principal. Withdrawals are intended to address issues such as religious beliefs and philosophical objections to testing. Parent/caregiver withdrawal does not constitute exemption. Withdrawn students will be considered as being absent from the testing. The principal is responsible for registering all parent/caregiver withdrawals. 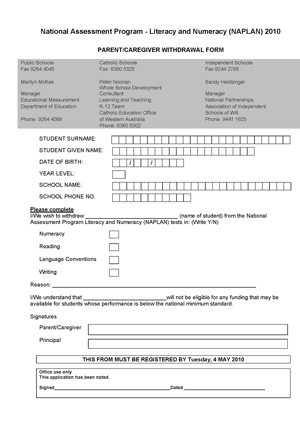 Western Australian schools use the form available on their state‘s website. In the Northern Territory, letters from the parent/caregiver should be provided to the principal and then forwarded to the Assessment and Reporting Manager by 1 April. It’s also interesting that should the school not have provided information to parents about the option to withdraw a student, there may even be legal grounds against the person responsible for overlooking such should a parent or carer pass the date by which this would need to be legally completed. It’s also rather incredible to reflect that some funding for needy students is being tied to participation in NAPLAN! 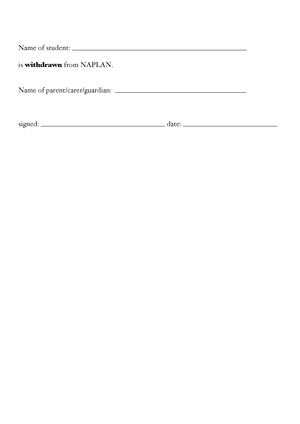 A pro forma is provided on page 25 and must be endorsed by the parent/caregiver who withdraws his/her child from the NAPLAN tests. The pro forma must be kept at the school and may be required for future reference. The principal must finalise all student withdrawals by Friday 30 April.